Combine lemon juice, simple syrup, water and salt into a large pitcher. Stir and place the lemonade in the fridge to chill. 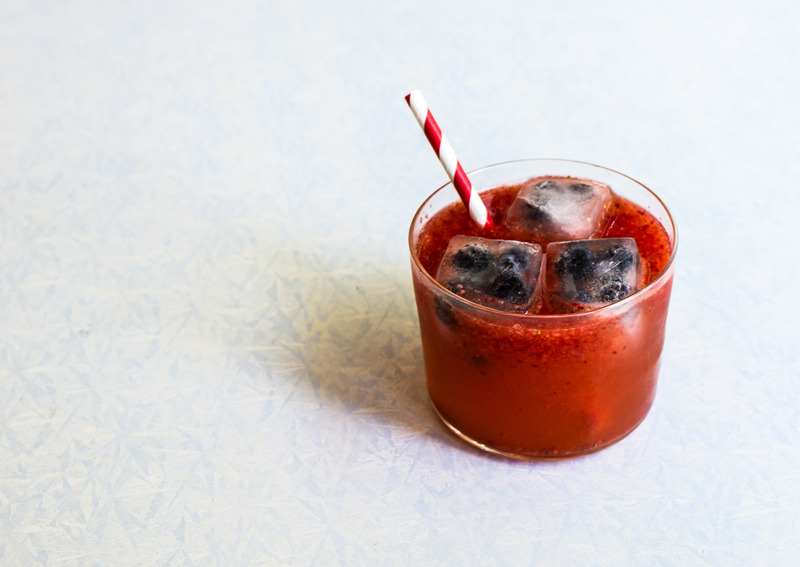 Fill each glass with 2 tablespoons of strawberry puree and blueberry ice cubes. Pour lemonade into each glass and stir. Serve immediately. Combine 1 cup of sugar and 1 cup of water in a saucepan. Heat through and stir until sugar has dissolved. Place the ingredients into a food processor and puree until the fruit is a smooth, soup-like consistency. Place in the fridge and chill before using. Place 2-4 blueberries in each compartment of an ice cube tray. Fill the tray with water and place in the freezer. Freeze for 24 hours or until solid.